Below is a list of the partners participating in the development of the RADICLE project. The Manufacturing Technology Centre (MTC) proves innovative manufacturing processes and technologies in an agile, low risk environment, in partnership with industry, academia and other institutions. We operate some of the most advanced manufacturing equipment in the world, and employ a team of highly skilled engineers, many of whom are experts in their field. This creates a high quality environment for the development and demonstration of new processes and technologies on an industrial scale. The MTC’s areas of expertise are directly relevant to both large and small companies, and are applicable across a wide range of industry sectors. The MTC’s members include global manufacturing companies from multiple sectors. Research partners include the University of Birmingham, University of Nottingham, Loughborough University and TWI Ltd. The MTC is part of the High Value Manufacturing Catapult which is supported by Innovate UK (formerly the Technology Strategy Board). General Electric (GE) is a global digital industrial company, transforming industry with software-defined machines and solutions that are connected, responsive and predictive. With products and services ranging from aircraft engines, power generation and oil and gas production equipment to medical imaging, financing and industrial products, we serve customers in approximately 180 countries and employ approximately 333,000 people worldwide. Since incorporation in 1892, GE has developed or acquired new technologies and services that have considerably broadened and changed the scope of activities – most recently by acquiring the energy sectors from Alstom. Centro Ricerche Fiat, founded in 1978, has the mission to develop and transfer innovative products, processes and methodologies in order to improve the competitiveness of the products of the Fiat Group. Also through the cooperation with a pan-European and increasingly global network of more than 1700 partners from Industry and academia, CRF conducts collaborative research initiatives at the national and international levels in partnership with all the key public and private stakeholders concerned with Sustainable Mobility, targeting specifically the industrial exploitation of research. Development of Manufacturing Technology underpins the remarkable capability that Rolls-Royce has today, with advanced solutions continuously being developed. Crucial to the development of robust and production-grade solutions is the network of seven Advanced Manufacturing Research Centres (five within UK), which are being established to help Rolls-Royce and other industrial partners achieve Best-in-Class capability across the full portfolio of manufacturing technology themes. A. Environmental care - GKN work actively to reduce the company’s environmental impact in the design and engineering of tomorrow’s aviation engines. B. Technology - Make It Light; the lighter an aircraft engine is, the less fuel it consumes for any given flight. GKN focus on developing lightweight solutions for aircraft engine structures and rotors, including a range of technologies developed through Swedish national programs and EU funded programs. Laser Optical Engineering Ltd (LOE) is an expert technology company, specialising in the development of innovative and bespoke laser based imaging products and services. Established as an independent spin-out company from Loughborough University in 1996, LOE is a customer focussed company offering you access to a range of expertise. We pride ourselves on an ability to turn theoretical ideas into commercial products which can be used in real-life situations. 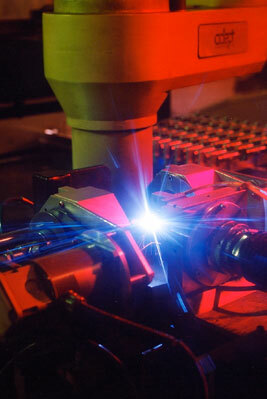 We offer laser materials processing production equipment to sheet metal using manufacturing industries. The core consists of robotised laser systems, increasing productivity, product quality and profitability for our customers. TWI is one of the world's foremost independent research and technology organisations. Based in Cambridge, UK, since 1946, and with several offices around the world, TWI has a long history of development and innovation in all aspects of materials joining and related technologies. TWI has over 800 staff and a turnover of €80m. The company is on the cutting edge of technological advancement and is recognised as one of the world's leading research and technology organisations. Part of TWI's strength is its broad range of expertise, allowing multi-disciplinary teams to provide a complete and integrated solution to industry-relevant problems. TWI's technologies fall in the areas of Structural Integrity and Corrosion Management, Non Destructive Testing, Welding and Joining Technologies, Material Processing and Manufacturing Support. 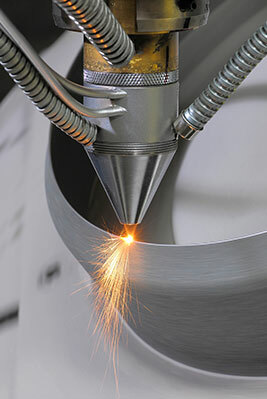 TWI has been involved in the development of laser materials processing since the late 1960s, TWI’s expertise includes the application, modelling and process development of laser welding for metallic materials. In addition, there is a significant amount of complimentary expertise available at TWI in supporting this project, including metallurgy, structural integrity and non-destructive testing. Part of TWI’s focus is to promote the manufacturing benefits offered by high-productivity welding processes across industries such as electronic, automotive and aerospace. BIT ADDICT is a technology innovation partner with expertise in software applications, IT systems, embedded electronics and machine solutions. Their highly skilled multidisciplinary engineering team specializes in helping customers develop complex distributed system involving embedded systems, PLCs, mobile devices, web services and desktop applications. BIT ADDICT makes use of the latest advancements in Virtual Reality, simulation, 3D visualization, Computer Vision and Internet-of-Things. Their customers are global leaders in industries such as health technology, simulation based training, automation, automotive, maritime and aerospace. The European Federation for Welding, Joining and Cutting (EWF) manages a harmonized system for training qualification and certification of welding personnel. It is also responsible for the Certification System of companies using welding, in Quality, Environment, Health and Safety. It was founded in 1992 and has nowadays 31 European member countries, represented by their national welding societies.